Hello, if you don’t already know by now, as millions surely already do, my name is Marjorie. 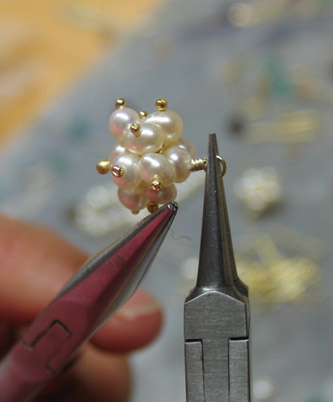 People know me as a bead jewelry designer with an obsessive penchant for gemstones, pearls, more gemstones, more pearls, even more gemstones and even more pearls, and, of course, all the other stuff, like chain, wire, sterling silver, and you know what else, I don’t have to tell you. And if you have heard that I spend more time on the internet than God, well, you might be right. I hang out at Land of Odds (www.landofodds.com), and you can reach me there anytime. 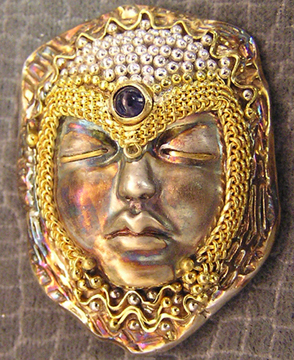 Point my nose in the right direction — jewelry on-line that people will want to talk about. And, darling, you better believe this is my real nose. The jewelry ain’t fake either. Let me take your hand, and guide your eye to see the treasures I have found below…. 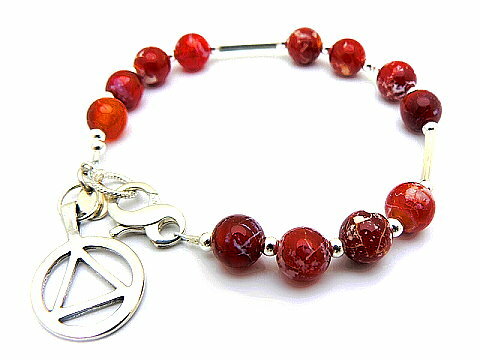 Linda Chandler has a forthright Internet page name: www.jewelrybylinda.com . 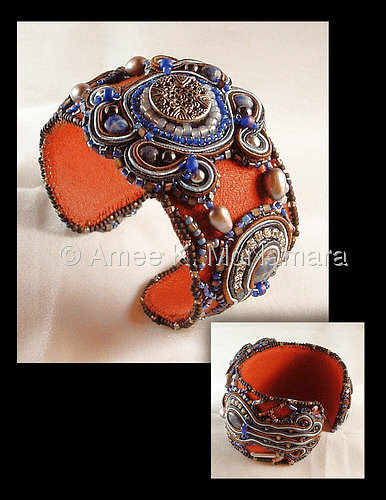 She shows off her incredible intricate designs on that website. 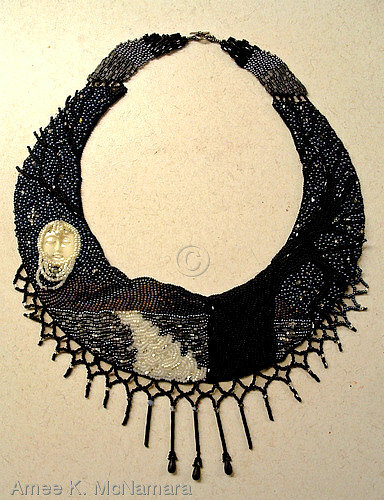 She has been designing and creating beautiful wire woven, Precious Metal Clay, and metalsmithed jewelry in Indianapolis, Indiana, for over 20 years. Linda’s basket weave bracelets are spectacular feats of wire bending at its absolute best. Linda knows that her hand woven bracelets are heirlooms in the making and let’s us know that “These basket weave bracelets are made completely by hand, extremely time consuming, intense labor and deep concentration goes into each design. I can only make these in spurts, short burst of energy, far and few between. 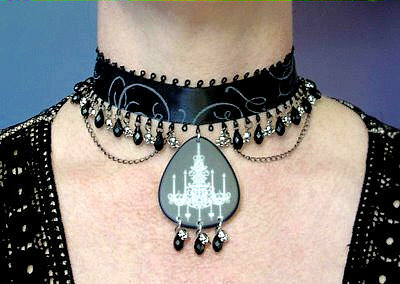 Designs are exclusively my own, you will never see my style of unique jewelry anywhere else. 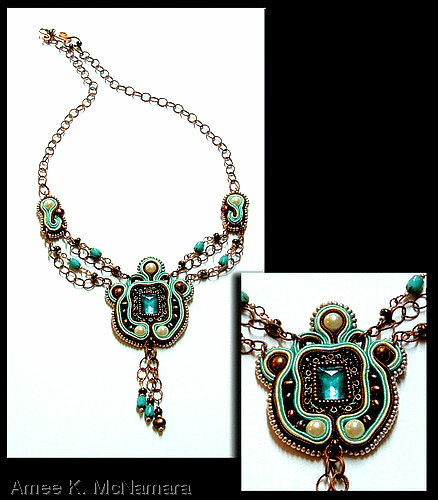 Skillfully hand crafted to last for generations.” With that in mind I feel that her prices are very reasonable and affordable for a specialty handcrafted piece of art jewelry. 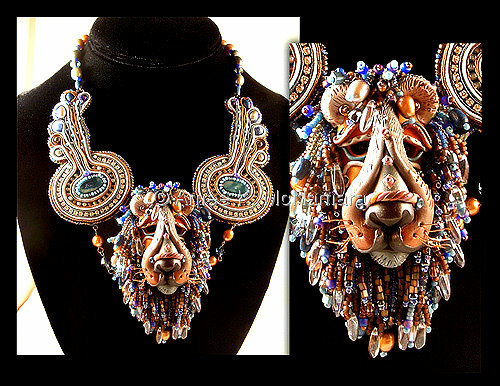 Two glorious pieces from her private collection of the PMC faces of Medusa and Sphinx have fashioned headdresses from wire and gemstones which are so stunning, that it is obvious why she will not part with them. 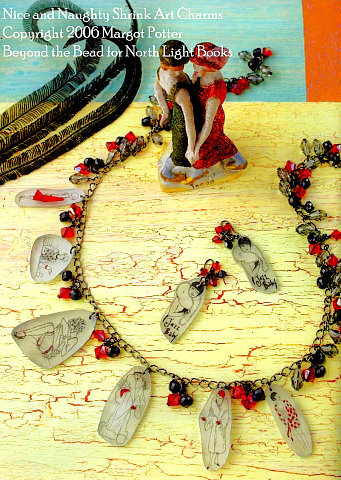 I also love the bracelets in Linda’s Gallery two, and again it is like peaking into the Linda Chandler Museum with many of the pieces sold or in her private collection. Linda will take orders, and perhaps one day I could convince her to part with one of them, or maybe I could learn to make a bracelet from her books or from the download she sells on her website. Be sure to check out www.jewelrybylinda.com and email Linda if you would like to order a keepsake for yourself or a gift to some very deserving person that you care for a great deal. Margot Potter is a renaissance woman. This “crafty chick,” from rural Pennsylvania has been crafting since she was “old enough to hold a Crayola®,” and is known as the Impatient Crafter.TM. 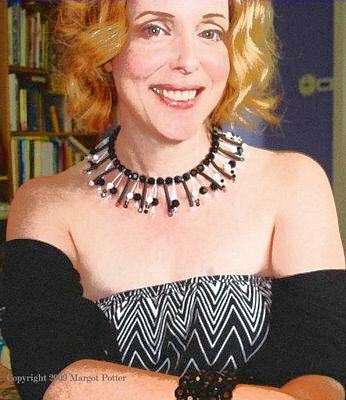 Among her many artistic specialties, Margot is a jewelry designer, author, actress, and television personality. 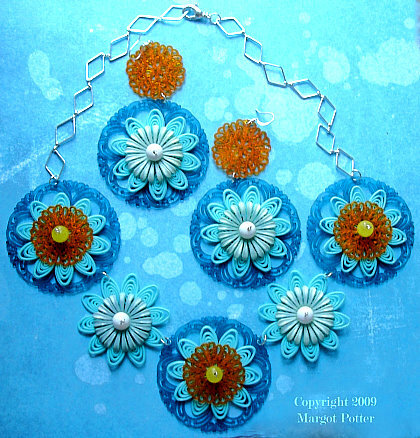 Being the Jewelry Spotter, I had been looking at another particular artist, but while at her website, I kept seeing jewelry designs by Margot. Those designs intrigued me so much that I wanted to see more and know more about the woman behind those wonderful fun designs. Start with Victorian designs; mix in a little 20’s through the 80’s retro inspirations, throw in some reclaimed recycled bits, and voilá, you have a “trash-to-treasure-trover,” Margot Potter masterpiece. Sometimes her musings may not lead to masterpiece status, but that is part of Margot’s unique philosophy of artistry. The prolific Margot has written five books, and her sixth book can be preordered from Amazon.com now. I remember when we got The Impatient Beader and The Inpatient Beader Gets Inspired in Be Dazzled Beads, and I was amused, intrigued, and yet I felt it was somewhat too crafty for me (not yet realizing that I too am a crafter at heart). I recommended her books numerous times, and I kept looking through them to pick up tips. 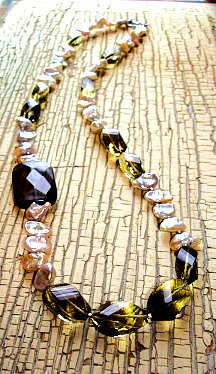 Now I am excited about getting Bead Chic, and recommending it for all the chic beaders in Nashville. I might have to have one myself. 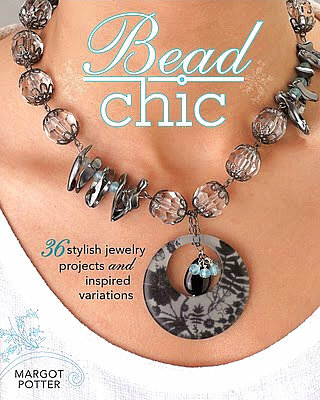 This is Margot’s description of Bead Chic and how she pitched it to her publisher; “Banana Republic and Sundance Catalog have a latté at Starbucks.” Mmmm, that sounds yummy, chi-chi, and beautiful to me. 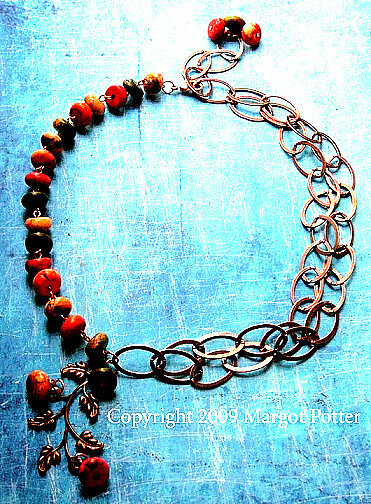 Margot is so giving to all of us jewelry designers and crafters by sharing her designs and inspirations on her websites and blogs. We crafters (kids and teens included), as well as anyone else who wants to be creative can take advantage of these huge opportunities to learn so many techniques and gain insights into the mind of this great designer and writer. 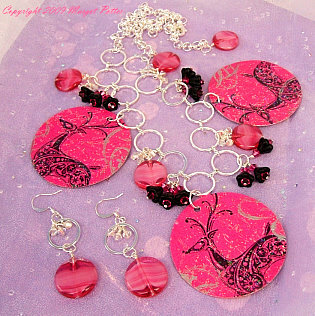 Entertaining, educational craft tutelage costs mega bucks at shows like Bead & Button (which is a huge and fabulous show), where the classes with great teachers from around the country, can cost many hundreds of dollars. “Madge” puts it out there online, and most of it is absolutely free. She deserves great credit for paying it forward in her own wonderful ways. 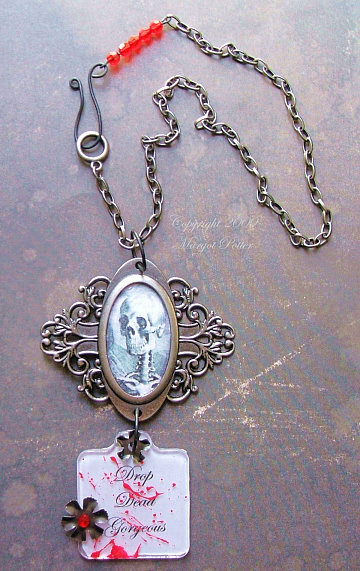 Margot, you are an idol to me and many, many an impatient crafter. Martha Stewart cannot hold a dyed pearl to you. You inspire many of us crafty irreverent types, who can only hope to be somewhat like you in this lifetime and the next three. How did you become so absolutely fabulous? You have a wonderful work ethic and a stick-to-itiveness that is uncommon in this 21st century. Your sixth sense of women’s need to create shows that it is as if you soaked up by osmosis the souls, hearts, and minds of all the creative women on this planet, and we became a part of you, and you became a part of us. All of your generous musings, patterns, ideas, and inspirations, are enough, but never enough to get us through our manic jewelry making frenzy. “When the weather changes to cold my studio heats up! This is the time of year that I have so many things going on in the studio at one time. 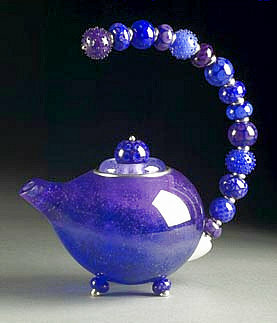 I bounce from glass torch to soldering station, from filing silver to cold-working glass.” Oh what a perfect time to fire up those torches, and let the muses of winter inspire and instigate the beauty that Kristina Logan designs and crafts in to her stunningly beautiful glass beads, jewelry and ornamental objects. I believe that Kristina Logan’s Art Glass works are THE most gorgeous and sumptuous glass I have placed my eyes upon online. I do so want to touch those beads and objects. 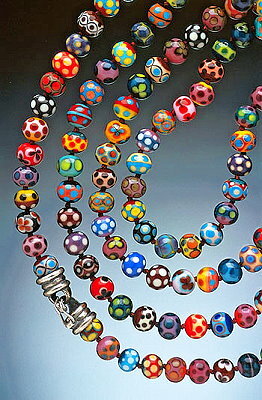 It would be an honor to work with such beads and to create a piece of jewelry worthy of those colors and patterns that strike me as richer looking than the richest handmade Persian carpets, colors that take my mind to the paintings from the masters, and the wondrous beauty of nature herself. 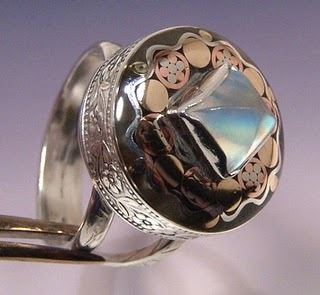 The big beautiful bold rings that Kristina creates are highly collectible. 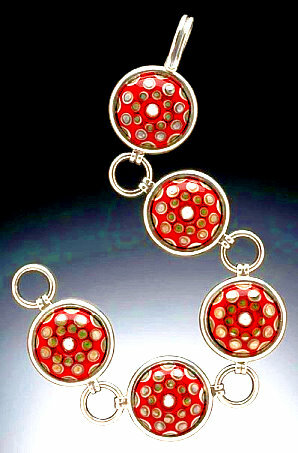 The detail work of her beads, with her sculpted sterling silver settings create fireworks for your fingers. Hammering silver around glass beads also puts life into perspective, as Kristina says; “It’s like a real exercise in impermanence.” I must have one of those stunning rings. 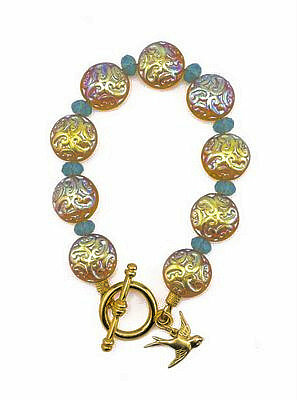 Kristina Logan is recognized internationally for her glass beads, jewelry and objects. She is an independent artist who lives and works in New Hampshire. 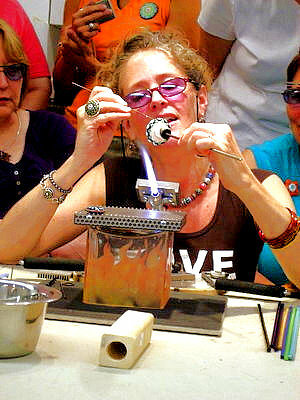 Kristina travels extensively throughout the United States and Europe teaching workshops and lecturing on contemporary glass beads and jewelry. Thanks to Kristina’s website and Bead & Button August 2007. Imagine it is the first decade of the 20th century in a remote area of Central Illinois. The nearest towns of any population are Chicago, 130 miles to the northeast, and Cincinnati, 260 miles to the east. Now imagine you are sitting in a large home on this beautiful prairie. Here in the tiny village of Funk’s Grove, by 1910, you have indoor plumbing, indoor and outdoor electricity including a lit tennis court, and telephone service years before these amenities came to the remote countryside (the Illinois Rural Electric Cooperative was not formed until 1936). That’s just part of the wonders of the Funk Prairie Home, located about 10 miles southwest of Bloomington, Illinois. The history of the Funk family is one of the most interesting biographical vignettes in America and deserves thorough perusal by anybody interested in real Americana. Isaac Funk built this exquisite home in 1864, but he did not enjoy the fruits of his labor. He lived only a short while after its completion. Son Lafayette made a name for himself as an Illinois State Senator and cattle entrepreneur. Grandson Lafayette II is the reason this article appears today on the Jewelry Spotter. The junior Lafayette Funk was born in Funk’s Grove in 1897. He was a highly knowledgeable agricultural specialist skilled in the hybridization of corn. Perhaps, you’ve heard of Funk’s G Hybrid Corn. 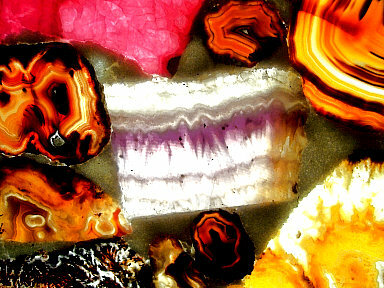 Funk loved nothing more than to collect gems and minerals. It was not just a hobby; it was a labor of love with no ending. He traveled the world for three decades leaving no stone unturned in his quest for finding anything of geological interest. His collection became voluminous, forcing a building to be constructed in 1974 to house the extensive collection. 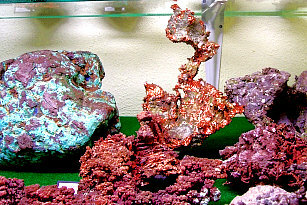 When I say that this gem and mineral museum is the finest in the country, it is an understatement. Representatives of the Smithsonian Institute say it’s so. Tour guide Bill Case has been conducting tours of the home and museum for two decades. As best as he can estimate, more than 100,000 people have taken the tour under his tenure. Yet, Case exhibits bounteous enthusiasm like it is his first day on the job. Case, and his wife, who also leads tours, became the tour guide almost by surprise. Before you walk in the museum, you see wonders on the building’s exterior. 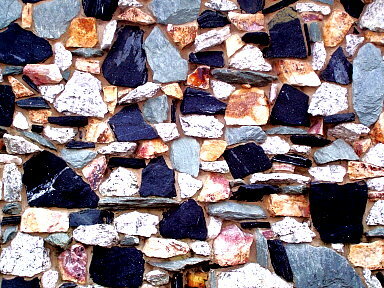 The façade of the building is made with hundreds of colorful raw gemstone specimens about the size of two bricks, and some are bigger. 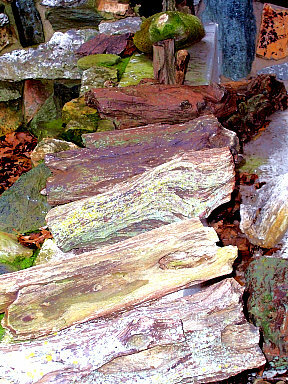 The outdoor entryway is lined with a xylophone of petrified rocks that emit the tones of a major scale. You learn right off the bat that for some things to be petrified it does not take centuries or even decades but a matter of moments to be turned into stone. As you walk in the entrance, you are entranced by an illuminated wall that looks at first to be a mural of various gems. 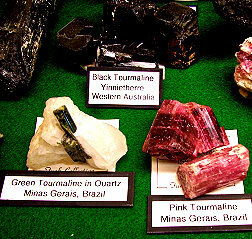 In fact, these are sliced sections of real precious and semi-precious gemstones. Once Case turns on the backlighting for these gemstones, this humble hallway becomes a panel more beautiful than any Tiffany lamp. Your heart will swoon to the beauty of those magnificently lit stones. The colors dance and pop right off this wall. Case lets you look behind the panel to see that indeed the stones were all sliced by hand, cut to different depths depending on the stones. It sets the tone for the next two hours. Once inside the main room, your eyes are bombarded with a wonderful mélange of color, various shapes and textures, and stones everywhere. Large panels of shellacked plywood with slices of agates, jaspers, and many other stones appear on your right after entering the main room. When you look closely, the big pages of plywood and stones form books of rocks. You can flip through the books and see that Lafayette Funk, Jr. had made these rock books by gluing each slice of stone onto a piece of corrugated cardboard and onto the plywood. He was inventive and worked with what he had on hand. The first room after entering through the gorgeous entryway and past the books of rocks is the fossil room for the kid in all of us. 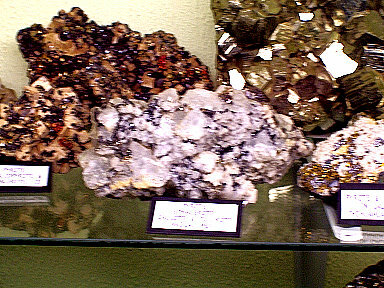 On the right on top of a glass case, the first thing you notice is the Coprolite (petrified dinosaur droppings). Kids giggle and laugh and want to touch it as it looks like a dinosaur just pooped it out. Next you notice the complete skull of the predator from which the Nashville Predators got their name, a Saber-Toothed Cat sits out for you to ooh, ah, and drool over. So many fossils of so many species, one has to buck up to make it through the entire museum that is so chock full of wonderful specimens. Next on the tour is the main hall with row after row of glass cases. This entire room contains tall, built-in cases with several shelves of large specimens, many of which you can touch and get the feel of these natural masterpieces from this third rock from the sun. The overwhelming and overflowing beauty of these specimens from around this planet, as well as some from the Moon, are all there for the public to enjoy for free. We really do live on a rock, and Case told us that with all the mining of minerals around the world for thousands of years that only about ten percent have been used. That makes me feel better knowing that the gems and stones that I love to use in creating jewelry have not eaten up the planet’s supplies. As Case guides you through the rows, you notice that the gems and stones you might know by one name from a book or online have a different name than the one on its placard in the cases. Case explains, “That’s why looking this stuff up sometimes in a book or on a website is hard because you’ve got to think of all the different names it can have. I have a bunch of different mineral books and in one it’s called this and another it’s called something else.” Rocks like people have many monikers. 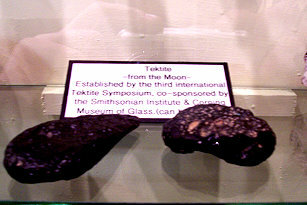 Funk had a talent for getting the best and most unique specimens. 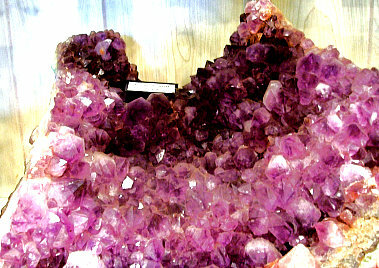 For instance the rhodocrosite in the museum is so spectacular. 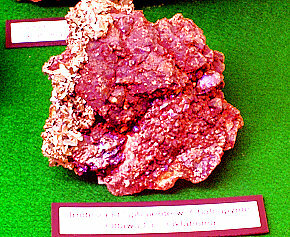 Case told me, “Every piece (in the case he was showing me) of rhodochrosite is from the American Tunnel in Silverton, Colorado. When they were blasting the tunnel through the Rockies, they hit a vein of rhodochrosite, and he happened to be there, and they let him go in and get it because he knew what it was and they didn’t.” Case further reiterated that “Lafayette must have had an incredible touch. He had the eye of an artist, and we still don’t know how he did some of the things he did.” Not only was Funk in the right place at the right time, he traveled the world after World War II teaching nations how to grow corn, not for remuneration, but for the world to better feed itself. He only asked for rock specimens. They allowed him to tour mines and hunt for rocks, or presented him with the best they had to offer. 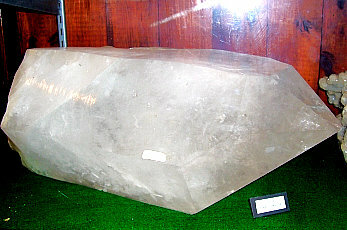 After touching some of the beautiful powerful large stones and gazing into all the cases until my eyes were nearly exhausted, Case directed me into a tiny little room. Soon he turned out the lights and my jaw dropped as the glow from the black-light lit up a case with rocks of every neon color imaginable. There were hot pinks, fluorescent greens, neon blues and purples that sent my mind spinning. Case explained that the colors are what bees see, and they are attracted to those bright colors, which are also in the plants and flowers. 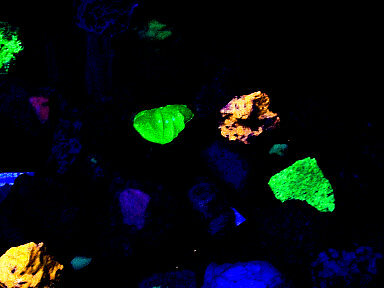 When the light was switched back on, the rocks appeared as ordinary, plain stones. Wow, what a neat and fun experience. Next I was off into a room filled with Native American artifacts, all collected in Illinois. Some of the collection still sits under the displays in cigar boxes that Funk had meant to get around to cataloging. By that time my mind was so over-filled with beauty and information, it was difficult to absorb much more. Yet, there was another room, housing a huge collection of carved jade from China, Japan, and Korea plus silver, crystals, sleighs, buggies, saddles, Funk’s G Hybrid promotional items, photos of Funk with Presidents, and on and on. It is almost endless, and it’s no longer confined to the interior. The museum has added beautiful Percheron horses to the barns and goats now roam the grounds. I haven’t even described the wonderful Funk Prairie Home. 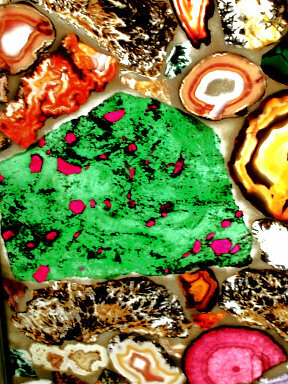 Even if you are not a gem and mineral connoisseur (bite my tongue), the tour of the home is as awe-inspiring as the museum. It gives Americans a great history lesson in just how intellectual and inspirational our 19th century citizens could be, and Case makes it the most interesting history lesson you’ll ever receive. 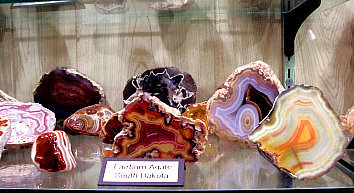 Funk Prairie Home & Gem Museum: Hours–9 a.m. to 4 p.m., Tuesday through Saturday, March through December. Directions: Funks Grove is located approximately 10 miles southwest of Bloomington, Illinois. To find the Funk Prairie Home, take I-55 south from Bloomington to Exit 154 (Shirley), and turn left at the exit. Cross the interstate, and take an immediate right onto the frontage road at the Funk’s G sign. The museum is on the left about 1.5 miles down this road. Other: Funk’s Grove proper is located on the west side of I-55 on the famous Mother Road, Route 66. The Funk family is famous for manufacturing the best maple sirup (yes sirup and not syrup) in North America. Having grown up in maple syrup country, I can attest that their sirup tastes better than any other I’ve had. It’s yet another great tourist stop where you can get your kicks on Route 66, but if you can’t make it there, you can order the pure maple sirup at www.funksgrove.org. South of exit 154 on I-55 is a rest area with a fantastic mini-museum of Route 66 history. Lions and Llamas and Beads, Oh My! The Wizard in the Land of Odds asked me to write about a polymer clay artist. I whined and said that I did not like any of the polymer clay artists that he had chosen. To tell you the truth I truly was not a fan of polymer clay. 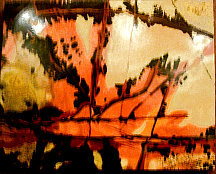 The idea of taking poly vinyl chloride and making something beautiful out of it was beyond my comprehension. Then one day quite by accident, I dropped onto the website of Amee K McNamara. Welcome to Amee’s particular brand of cheerful lunacy. Amee has been creating all sorts of creatures from her magical polymer clay including crabs and llamas. I look forward to seeing those in the future. 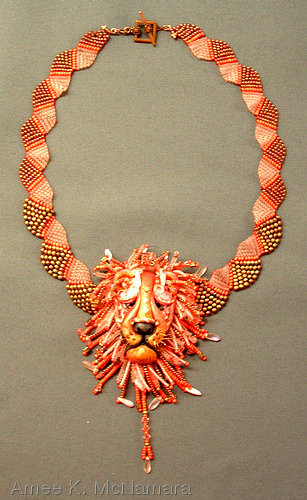 Go take a look for yourself, and you will find a truly amazing bead, polymer clay jewelry designer as well as a fine painter to boot. I know this is not like me. 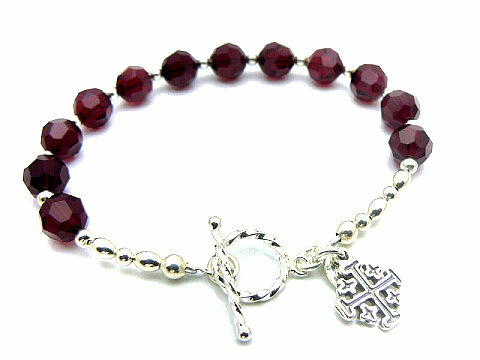 I love a good glass of Pinot Noir every now and again, but the gemstone colors and the beautiful detail of the sterling silver and pewter charms on the Twelve Bead website is downright inspirational. Way back in the 90’s I was involved in the 12 step community, and I took what I needed and left the rest. 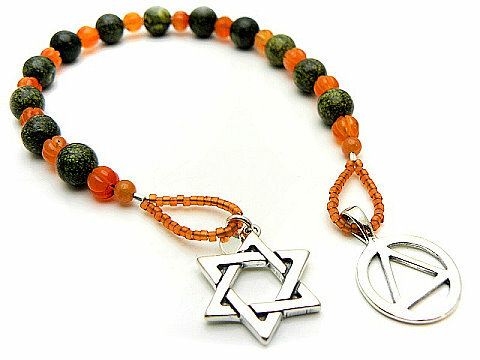 The Twelve Bead website is fairly anonymous, as to who actually creates the jewelry and prayer beads, but Gwen R. has the copyright on the website. Well Gwen you do beautiful work. 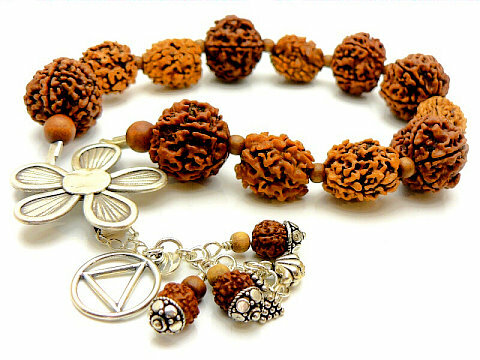 Simple beads placed in a circle either as a bracelet or prayer beads along with a simple meditation can take the possessor to a calm and serene state of mind. Twelve Bead uses gemstones with a purpose, and gives the shopper the historical and contemplative qualities of those stones and symbols. The beautifully photographed slideshow at the entrance to the Twelve Bead website shows off the elegance and allure of the beads and symbols. I feel calmer just studying their images. A powerful presentation that soothes the senses and draws in the browser to look closer at what they have to offer. Twelve Bead offers prayer beads and recovery jewelry with the intention that it be used in meditation or prayer in conjunction with a twelve step program. I say that many people of all backgrounds and affiliations with or without a need for a 12 step program could benefit from Twelve Bead’s beautiful well-designed prayer beads and jewelry. We all deserve a little extra hope and inspiration. 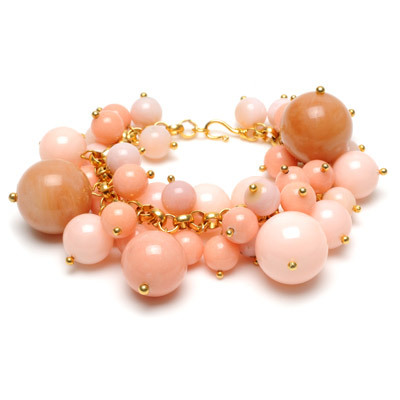 Oh what fun it is to shop online at Wendy Mink Jewelry! 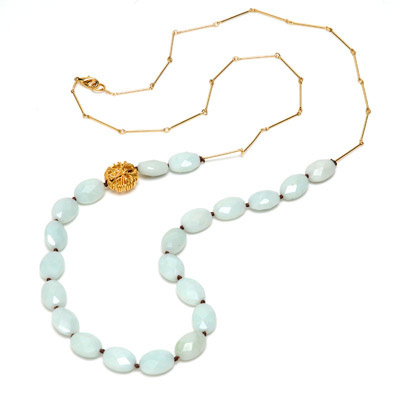 I can just imagine how ecstatic I would be to shop in the Wendy Mink boutiques in Manhattan with all the hand-cut Indian stones, gold vermeil, resin and sterling silver being just some of the high quality materials used in the Wendy Mink collections. They create five of these collections per year, with up to 300 styles per season. Each piece of Wendy Mink’s Jewelry is handcrafted in their New York City studio. 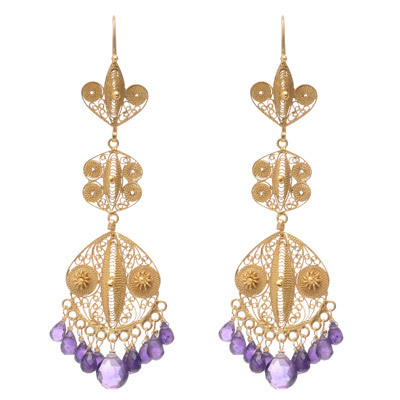 The studio and one of their shops in the Tribeca neighborhood are where a team of Tibetan jewelry artisans work right alongside production and sales staff. These artisans have collaborated with Wendy for more than 17 years and lend their own skills, techniques and design direction. Take a virtual tour of both shops and the design studio at the Wendy Mink website. The Wendy Mink Collections are found in department stores and boutiques throughout the United States, Europe, Asia and Australia. Wendy has truly made it in the fashion jewelry business, yet she still designs and creates one-of-a-kind, beautifully handcrafted pieces of jewelry. Check out all the fashion magazines that feature her designs. 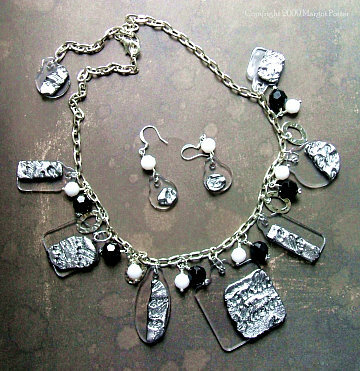 When you shop her website click on the “Shop Samples,” as you might just find a necklace for sale that was featured in one of those major fashion magazines. One of Wendy’s clever marketing tools is to have customers e-mail pictures of themselves wearing their Wendy Mink Jewelry, so they can upload it onto the Gallery page of her website. Who doesn’t want to show off their pretty new bling, and show your picture off to all your friends and relatives, who will in turn look at all the pretty jewelry for sale on the website? 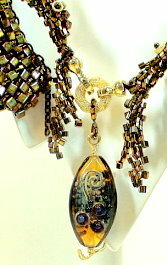 One can readily spot Wendy’s deep love and passion for the materials she uses in her creations. 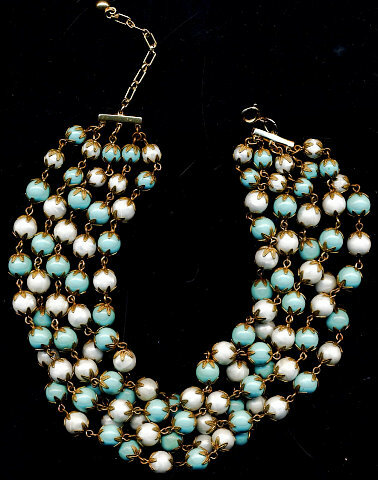 What comes through on Wendy’s blog is her love of fun, cake, beads, dogs, and Mad Men with great fun 1950’s and 1960’s inspired jewelry. 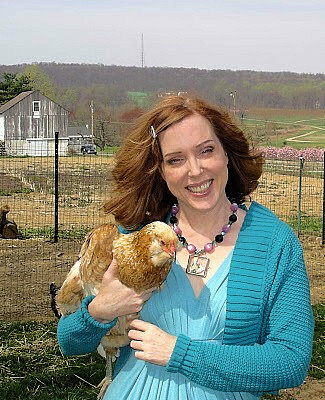 Wendy Mink is a role model for all aspiring jewelry designers and bloggers. 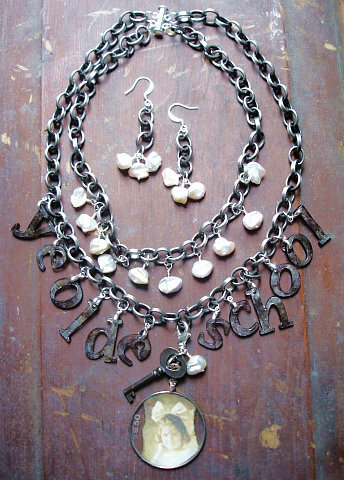 I wish she had a jewelry business school. I know Warren; we already have business classes at Be Dazzled Beads. Perhaps I should sign up for some. 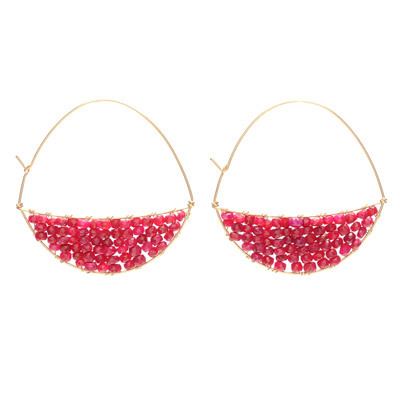 Anyway, take a good long look at all the beautiful jewelry at Wendy Mink Jewelry online. She also has vintage bling for sale. Land of Odds provides bead and jewelry making artists with virtually all their beads, supplies, books and jewelry findings needs, with over 30,000 products. 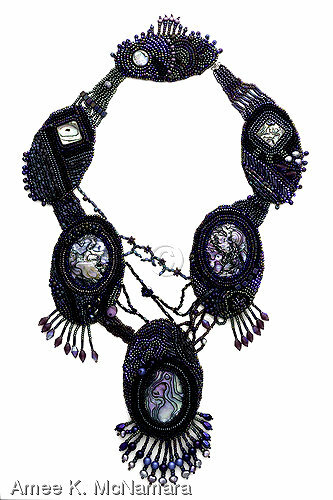 Home of The Ugly Necklace Contest-A Jewelry Design Competition With A Twist, The Illustrative Beader: Beaded Tapestry Competition, and of All Dolled Up: Beaded Art Doll Competition. I also have a blog (elleschroeder.blogspot.com) titled “Not All Who Wander are Lost.” Perhaps I could blog about Land of Odds with a link to you and you could guest blog for me. I love knowing people like you who are so passionate about what they love. That makes two of us! Immediately, the post is really the greatest on this precious topic. I harmonise with your conclusions and definitely will thirstily look forward to your incoming updates. Simply just saying thanks will certainly not simply just be sufficient, for the extraordinary lucidity in your writing. I will certainly immediately grab your rss feed to stay abreast of any kind of updates. Genuine work and also much success in your business endeavors! Enormous post – and solid domain by the way! 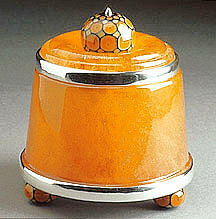 It a good site which help the visitors come to know about the jewelry. Substantially, the post is actually the greatest on this worthw hile topic. I harmonise with your conclusions and can thirstily look forward to your coming updates. Simply saying thanks definitely will not just be enough, for the extraordinary lucidity in your writing. I can instantly grab your rss feed to stay abreast of any updates. Fabulous work and also much success in your business enterprize! I am slightly certain I’ll learn a lot of new stuff right right here! Best of luck for the next! Hi there everyone, it’s my first pay a visit at this web page, and post is really fruitful for me, keep up posting such posts.